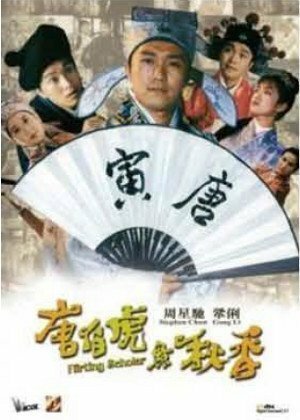 Stephen Chow and Lee Lik-Chi both direct this wacky comedy in which a scholar pretends to be a live-in houseboy for a rich family so he can get close to the girl he falls in love with. Tong Pak-Fu is a famous, wealthy Ming Dynasty scholar, and he’s very good in poetry, painting and music. However, he also has eight wives who don’t share his interest or understand him. They play mahjong, drink till they throw up the whole day, and worst, they never respect his work. A talented scholar he might be, but a very miserable one indeed. One morning, while flirting around town with his scholar friends, he comes across a beautiful servant from the Wah family and falls madly in love with her. In order to be near her to win her heart, he must find a way to get into the Wah estate. After some sneaky persuasion, he manages to get a job as a houseboy there, leading to some very funny situations while he courts the girl of his dream. As usual, Stephen Chow is in top form as Tong Pak-Fu in this very well directed comedy, showing us he’s the boss of ‘mo lei tau’ or ‘make no sense’ style of comedy. His character is very much the Chinese version of Shakespeare; he excels in poetry, tradition painting and even kung fu. In general, the movie looks fantastic, the sets are colourful and cheerful looking. The costumes are beautiful, especially those worn by the wealthy characters. “Flirting Scholar” is actually a song and dance movie that touches on Chinese tradition, culture and even opera, resulting in the use, mainly, of traditional instruments heard on the soundtrack. There is even a poetry reciting sequence that turns into a crazy sort of Chinese poetry rap, which is very funny. There are some light CGI effects during the fight scenes which are filmed in a comical manner but are still fun to watch. Chow Heung , the servant girl from the Wah family is played by the gorgeous Gong Li, and her chemistry with Stephen Chow is good, but unfortunately she’s a bit under used here. She has nothing much to do but to look pretty in the movie, in which she is more than adequate. However, veteran Shaw Brothers star Cheng Pei-Pei is fantastic as Madame Wah, the kung fu wife of the Wah family. She is both funny, charming and really shines when it comes to the action scenes. I’m sure most viewers will definitely be smitten by her. Another Shaw Brothers veteran, Gordon Liu turns up as the Evil Scholar during the latter part of the movie and even though he has a small part, he still lights up the screen. There are some minor wacky characters like the Four Perverted Heroes who try to kidnap the beautiful Chow Heung, without success of course. Look out for Francis Ng who plays one of Tong Pak-Fu’s scholar friends. Overall, “Flirting Scholar” is outrageously funny, with a clever script full of great slapstick humour that takes on the Chinese culture and tradition with hilarious results. However, if the viewers can understand Cantonese, they will certainly enjoy the movie more. The English subtitles just don’t do it justice and fail to keep up the fast pace most of the times. Nevertheless, it’s still a must watch for Stephen Chow’s fans and it will certainly make you smile.